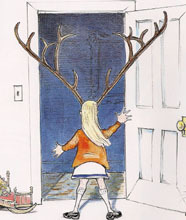 Imogene wakes up one morning to discover she has sprouted a tremendous set of antlers. She accepts this calamity with grace while others around her panic and overreact. Imogene wakes up one morning to discover she has sprouted a tremendous set of antlers. She accepts this calamity with grace while others around her panic and overreact. Her patience is eventually rewarded when the antlers vanish as suddenly as they appeared -- only to be replaced by another surprise!